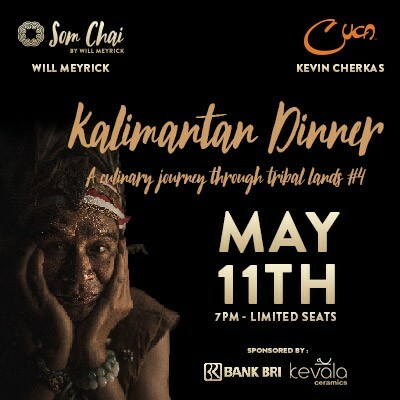 Unlike any other Chefs’ dinner you have ever attended, this one, to be held at Som Chai restaurant in Seminyak on May 11, 2019, promises to be much more than a meal. An evening that started months ago when heavy weight Chefs Will Meyrick from Sarong Group and Kevin Cherkas from Cuca restaurant landed in southern Kalimantan to discover the stories behind all its delicious traditional dishes. They immersed themselves in the history, recipes, culture and nature of the region and put together their lifetime knowledge and passion for food to proudly bring you their very own Kalimantan inspired creations. A true collaboration built on hours and hours of day long discoveries, late night discussions and early morning trials. "Will sees a new dish as a child sees a puppy, the excitement and love he has for food is unlike anyone else I have ever met." – says Kevin about his partner in crime for this adventure. “Kevin grasps the stories behind dishes; his thought process allows him to see things in a completely new way” - is Will’s view on Kevin’s approach to cuisine. premiere of a short documentary depicting the chefs' exciting journey and their behind-the-scenes kitchen sessions to jointly create the dishes for this event. But the highlight of the evening will of course be the food: a story-like menu divided in chapters that will convey the soul, flavors and identity of south Kalimantan through the trained taste buds and fearless creativity of the two chefs. Please note: 10% Government Tax and 7.5% Service Charge plus booking fee will apply to all tickets and tables at checkout. Seating allocation is not guaranteed.